Developing a stimulating and inspirational environment for students. Kirklees College is a further education College with two main sites in Huddersfield and Dewsbury. When relocating their Huddersfield Centre to the new state-of-the-art Waterfront campus; the College wanted to develop a stimulating and inspirational environment, where students could learn in bright and modern surroundings. Godfrey Syrett was the chosen supplier selected to undertake the project after a tender process utilising the CPC’s Office Furniture framework. 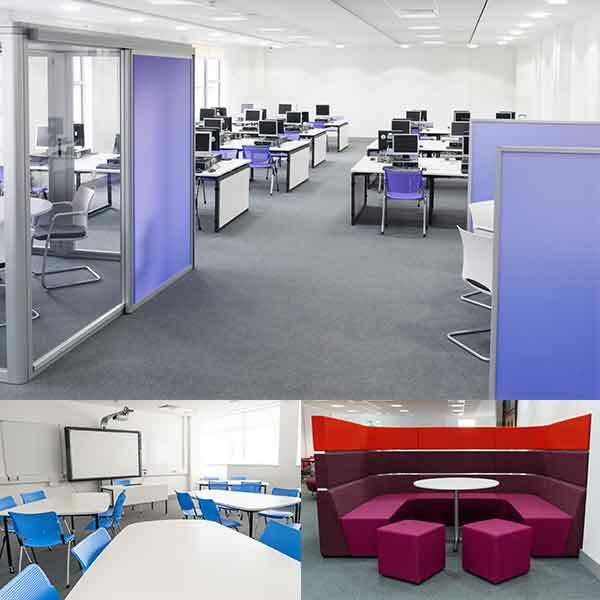 The supplier's Design and Space Planning teams worked closely with the College throughout the 6-week project and they provided concepts and layouts for each area of the build, which included: teaching areas, tutorial spaces, breakout areas and meeting rooms over 8 floors. As part of their end-to-end service, Godfrey Syrett managed the project working closely with the architect and Estates Team. Godfrey Syrett has almost 70 years’ experience in supplying and fitting furniture solutions, the team at Kirklees College could relax in the knowledge that the job was in expert hands.